Buster Keaton (Joseph Frank Keaton,1895-1966) had a distinguished and productive fifty-year career as a producer, director, writer, and actor. But what elevates Keaton into the pantheon of movie-making greats is the string of silent films he made during the 1920s. These films – including Our Hospitality (1923), Sherlock Jr. (1924), The Navigator (1924), The General (1926), Steamboat Bill, Jr. (1928), and The Cameraman (1928) – all featured Keaton as the modest but determined protagonist fighting a comic uphill battle. Of all of those Keaton films during that run, though, perhaps the most manic and brilliant of them is Seven Chances (1925). Like many of his films, this one builds up its pace as it goes along, but in this case the frenzied intensity that it ultimately achieves is unparalleled and a work of genius. Keaton’s cinematic style revolves around the theatrical persona that he always portrayed. This was supported by his patented porkpie hat (which singled him out), his perpetual upright posture, and his customary deadpan expression (which earned him the moniker “The Great Stone Face”) in response to the numerous setbacks that befall him. In some sense you could say that Keaton’s character personified the innocent Everyman within all of us – the hopeful boy scout struggling to avoid being overwhelmed by life’s capricious interventions. Keaton developed his famous deadpan expression and his ability to withstand potentially dangerous pratfalls as a child vaudeville stage performer for his family’s traveling medicine show. As a consequence, in all of these films, Keaton performed all his own stunts. And part of our astonishment in watching his films concerns how he managed to survive the large number of life-threatening scenes that he staged for the camera. Remember, this was all done on constrained budgets and before the special-effect technology available today. Another fascinating feature of Keaton’s cinematic style was the unique way he fashioned his narrative structure. He generally avoids the usual technique of setting the viewer up with tense anticipation of some event that is expected to occur; instead he presents a stream of unexpected events that continually surprise (and amuse) the viewer . This is the essence of his humor. All of this is on display in Seven Chances, which was based on a story by David Belasco that had been fashioned into the hit Broadway play, Seven Chances (1916), by Roi Cooper Megrue. In fact Keaton wasn’t particularly enamored of this play, and he added some scenes toward the end of the narrative that make the film an extraordinary work. 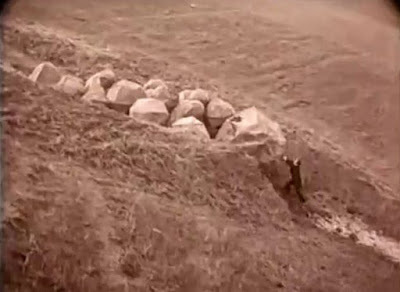 In particular, the famous stone avalanche scene was only added after Keaton gauged a preview audience’s reaction to an early cut of the film. The story of Seven Chances has four rather distinct acts. Each successive act quite literally accelerates the pace of the film. The first act involves mostly standing around; the second act involves walking; the third act involves running; and the final act is an even more desperate sprint. Throughout the course of these acts, the film moves more and more into an expressionistic nightmare of almost cosmic proportions. 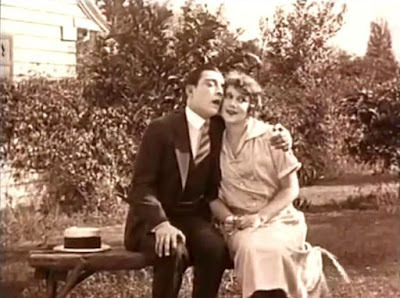 The opening scenes (presented only in this part using an early version of Technicolor) covering a period of more than a year, show five almost static shots of the shy and tongue-tied Jimmy Shannon (Buster Keaton) unable to tell his girlfriend Mary Jones (Ruth Dwyer) that he loves her. Telling a girl that he loves her will soon be his mission in this story. Then the scene shifts to Jimmy’s workplace. He and his partner Billy Meekin (T. Roy Barnes) run a brokerage firm that is facing huge deficits. To avoid prison, they need money fast. However, a lawyer with some promising news approaches them, and after several missed connections and misadventures, Jimmy and Meekin learn what is on offer. Jimmy is to inherit seven million dollars  if he is married by 7pm on his 27th birthday, which just happens to be that very day. So Jimmy has to get married within a few hours to collect the money. Jimmy rushes over to Mary to propose to her, but she is offended by Jimmy’s blundering mention of the money he stands to earn if her can marry someone on that day, so she kicks him out. Soon Mary, after talking to her mother, has a change of heart and wants Jimmy back, but she can’t get in touch with him. The heartbroken Jimmy returns to Meekin, who convinces him that they should head over to their country club and hitch Jimmy up with someone else. Jimmy is familiar with seven single women at the club, and this act is mostly a string of sight gags showing Jimmy’s hurried and unsuccessful proposals. Not knowing about Jimmy’s potential inheritance, the women all laughingly dismiss Jimmy’s proposals out of hand. After failing with the seven women, Jimmy even tries the club’s hatcheck girl to no avail. Then he runs out into the street and approaches random women, including a real, and in those days famous, female impersonator, Julian Eltinge. Now it’s getting late. Meekin posts a front-page notice in the afternoon newspaper calling for any woman to appear at the Broad Street Church by 5pm in order to marry into a seven million dollar fortune. Meekin tells Jimmy to show up at the church and be ready to marry. Up to this point, more than halfway through the film, the comic scenes have been conventionally humorous, but now things start getting surreal. Jimmy shows up at the church and takes a snooze in one of the pews. While he is sleeping, the church gradually fills up with an enormous crowd of avaricious women who have read the newspaper notice and are hoping to marry a millionaire. They have all come with makeshift bridal veils and are intent to tie the knot. When the alarmed church minister sees the huge crowd, he announces to them that the whole thing must be a hoax. Infuriated, the women all vengefully turn on Jimmy and he runs for his life. The chase is on, and this is where the film gets interesting and takes an expressionistic turn. The mob of angry women, when observed by a gradually receding camera, becomes more of an abstraction, appearing more and more like a marauding horde of predatory brigands intent on destroying everything in its path. 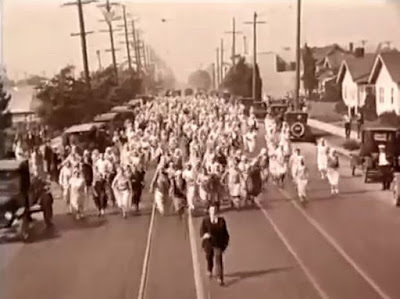 There are a number of shots showing the increasingly destructive powers of the out-of-control mob of rampaging women, as they chase after the terrified Jimmy. Even the police in the area run away and hide. Jimmy has by this time learned of Mary’s change of heart, and when he happens to run by Meekin, Jimmy yells at him to bring the minister to Mary’s house and that he will try to meet him there before 7pm. Now things become even more surreal. Jimmy runs out into the countryside with an enormous, unruly horde of brick-carrying women in hot pursuit. When he scampers down a hillside, he accidentally dislodges some rocks which quickly sets off a massive avalanche. Jimmy is soon dodging gigantic boulders that are as big as he is and threaten to crush him. At this point, nature itself has turned on Jimmy – the entire universe appears set on his destruction. In fact the rockslide is so horrific that it makes the hitherto implacable horde of enraged women flee in terror. The film has now become an expressionistic nightmare. Jimmy is still trying to make it to Mary’s house, and it is now just minutes before 7pm. You will have to see for yourself what happens in the end. It seems that Buster Keaton embellished the original Seven Chances play with these last two acts of the film. What he achieved is a level of slapstick that pushes the boundaries of credibility and even humor. The idea that “Hell has no fury like a woman scorned” has been taken to its limits, and the film spoofs the more tender gender by holding up an absurd caricature of its opposite temper. But Keaton managed to put it all together and maintain a tenor of mind-bendingly outrageous humor throughout. And for this reason Seven Chances stands as a testament to one of the masters of film expression. Roger Ebert, “The Films of Buster Keaton”, RogerEbert.com, (10 November 2002). $7 million in 1925 would be close to $100 million today. 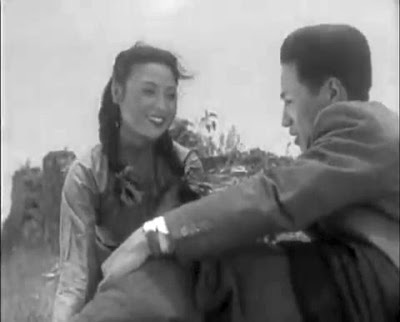 Spring in a Small Town (Xiao chéng zhī chūn, 1948), though long neglected, is now seen as one of China’s greatest films. In fact the 2005 the Hong Kong Film Awards Association named it the greatest Chinese film ever made . Directed by Fei Mu during the brief reflourishing of the Chinese film industry in Shanghai after the devastating Sino-Japanese War (1937-45) and before the Maoist takeover in 1949, the film was early on dismissed by the Communist authorities for its supposedly bourgeois subject matter. In fact when the Communists took over, Fei fled to Hong Kong where he died shortly thereafter in 1951 at the age of forty-four. Spring in a Small Town was his last film. The film’s early neglect was presumably due to its supposed eschewal of gritty socialist realism (which was the dominant art culture among socialist countries in those days) and for its pursual instead of sentimental melodrama . But today we can see that Spring in a Small Town operates on a higher plane and is a superb expression of universal feelings about love and family commitments. However, even though the film concerns universal feelings and hesitations about the demands of love, it can be even more appreciated if we keep in mind the then ravaged conditions of Chinese society. These provide an unspoken but powerful backdrop to what goes on in the story. The horrific annihilation brought about by the Sino-Japanese War is almost unimaginable for us today, and the Chinese suffered the worst of it. The most authoritative estimate from historian Rana Mitter puts the Chinese death toll at 15-20 million people, with more than 90 million people made homeless . The Japanese military’s “Three Alls Policy”, alone, is said to have to led to the deaths of 2.7 million civilians . And “the property loss suffered by the Chinese was valued at 383 billion US dollars according to the currency exchange rate in July 1937, roughly 50 times the gross domestic product of Japan at that time (US$7.7 billion).” . So it is no wonder that two of Spring in a Small Town’s main characters, having seen such ruination, suffer from depression concerning the what may have seemed to be the hopelessness of life. Nevertheless, evidence of these aspects of horrific ruination is all only in the background and so are only obliquely alluded to in the film. The story of Spring in a Small Town concerns a married woman whose life is disrupted when a man whom she had loved in the past comes for an extended visit at her homestead. Not surprisingly, the man’s visit revives her old romantic feelings, since this man was her one true love. In this regard the film can be compared to some outstanding, similarly-themed films that were made by three cinematic masters across the globe: David Lean’s Brief Encounter (1948), Satyajit Ray’s Kapurush (1965), and Wong Kar Wai’s In the Mood for Love (2000). The closest narrative match is to that of Kapurush, but all four films concerns the tentative considerations of adulterous love. Spring in a Small Town not only belongs in this grouping but may be the best of them all. A key feature of Spring in a Small Town is the understated mise-en-scene of Fei Mu. As I have been reminded by my Chinese friends, traditional Chinese social culture is essentially a “no touch” society. Social gestures are traditionally restrained, particularly with respect to physical interactions. In this connection Fei’s camera accordingly maintains (mostly) a respectful distance. There are many medium long shots and long shots, with few closeups. In addition there are a number of sequences with limited dialogue, where the emphasis is more on the modest, subtle gestures and expressions of the players concerned. The occasional voiceovers remind us that the story is primarily a contemplative recollection on the part of the main character, Zhou Yuwen. But the use of voiceover is restrained, and Fei Mu expressed through physical gestures what was probably more explicitly articulated in the original story by Li Tianji. The feeling of internal, impressionistic consciousness is further enhanced by Fei’s extensive use of dissolves instead of cuts to connect shots depicted in the film. The story has only five characters and takes place almost entirely at the residence of the Dai family. Although it comprises a gradually flowing stream of scenes involving these characters, I break the story into four phases. To trace the back-and-forth momentum associated with the uncertain relationship between the two main players, I employ some symbolic indicators. Places were the main female character, Yuwen, is making subtle encouraging gestures towards romantic involvement I identify with “(Y+)”, whereas when she is doubtful and making discouraging gestures, I use “(Y-)”. Similar signage is used for her would-be romantic partner, Zhichen. 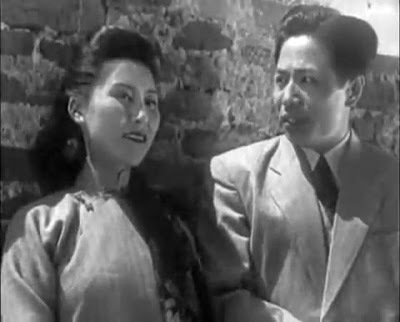 Yuwen indicates that she lives and sleeps apart from her husband and barely exchanges any words with him. She does attend to her wifely duties, though, like going out to buy food and medicine. Also living with them is Liyan’s young sister, Xiu, who is approaching her sixteenth birthday. Unlike Liyan and Yuwen, who are both depressed, Xiu is a vibrant teenager full of youthful energy. Into this setting comes a former classmate and old friend of Liyan, Zhang Zhichen (Li Wei), who has returned to the village after being away for ten years. While Liyan is steeped in the past, Zhichen is a modernist – he is now a medical doctor and is always clad in a Western coat and tie. When Liyan introduces Zhichen to his wife, they immediately, but silently, recognize a fact unbeknownst to Liyan – that they were once lovers back when Zhichen lived in the area,. Not knowing anything about the former passion between Zhichen and Yuwen, Liyan warmly insists that his old friend stay with them for awhile so that he and Zhichen can renew their acquaintance. Zhichen is given a separate, externally-accessed bedroom in the compound, and when Yuwen comes there to give him a water pitcher, he invites her to sit down and chat. When he touches her hand (Z+), they both freeze for a second and then proceed as if it were nothing. She tells him that because of the war ravages, electric power is limited and there are scheduled power outages every night. These nightly periods of darkness will, of course, add to the romantic atmosphere of subsequent evening encounters. This is the first time that the previously unresponsive Yuwen gives a more positive response. Now she becomes more active in this connection. Time passes, and it is now the ninth day of Zhichen’s visit. Xiu is clearly attracted to Zhichen and finds excuses to spend flirtatious time with him. This arouses Yuwen’s silent jealously, and she becomes more sulky than ever. Finally Yuwen comes to Zhichen’s room at night and provocatively turns off his room light (Y+). 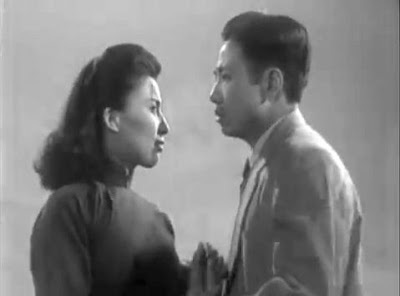 Zhichen turns it back on (Z-) and scolds her for coming to him behind Liyan’s back (Z-). This brings Yuwen to tears (Y+). Later when Liyan and Yuwen have one of their brief meetings, Liyan, who is still ignorant of the attraction between Zhichen and his wife, tells her to fix up a marriage arrangement between Zhichen and Xiu. Worried, Yuwen arranges another meeting with Zhichen at the city wall. Zhichen then grabs hold of her (Z+), but she runs away from him. After this there is an interlude with the celebration of Xiu’s sixteenth birthday. At the party they all start drinking too much alcohol and playing drinking-party hand games like rock-paper-scissors. Amid the frivolity Xiu notices Zhichen woozily seeking to hold Yuwen’s hand. Later that evening during the power outage, the still-inebriated Yuwen dresses up and bravely goes to Zhichen’s room (Y+). Zhichen blocks her at the doorway (Z-), but she shoulders her way past him and enters the room. When she tries to kiss him, he picks her up in his arms, and she again leans forward to kiss him (Z+,Y+). But the conflicted Zhichen can’t go through with it, and he puts her down in a chair and runs outside (Z-). After further conflict between the two of them, Yuwen returns disconsolately to her room. Liyan, who throughout the story remains a decent man, can’t help noticing Yuwen’s increased vitality whenever Zhichen is around. He finally nobly tells her that Zhichen is better for her than he is. And then he asks her if she is still in love with Zhichen. She becomes tearful, but doesn’t say. By now the conflict between love and duty has become unbearable for all of them. 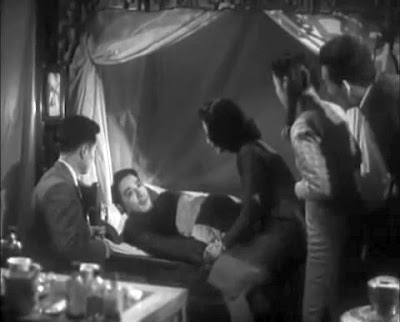 Both Liyan and Yuwen contemplate suicide, while Zhichen tells Liyan that he is going to go away the next day. 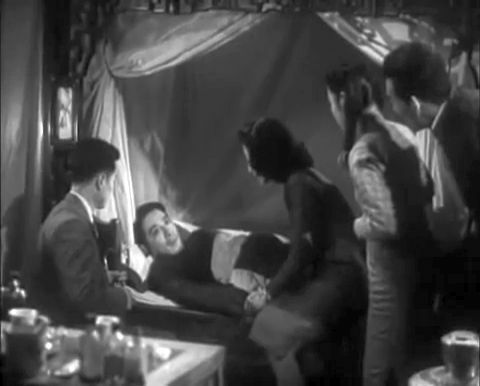 Liyan’s attempt to overdose with sleeping pills is thwarted by Zhichen’s anticipatory substitution of the sleeping pills with vitamin pills, but Liyan suffers a heart attack anyway and passes out. Seeing her unconscious husband makes Yuwen burst into tears, as she is overcome with guilt. But later Liyan revives, much to everyone’s relief. Afterwards Xiu, who has had more of a chance to observe the couple’s subtle interactions, asks Yuwen if she and Zhichen are in love. And Yuwen admits to her that it is true. The next morning Xiu and Lao Huang accompany the departing Zhichen to the train station. 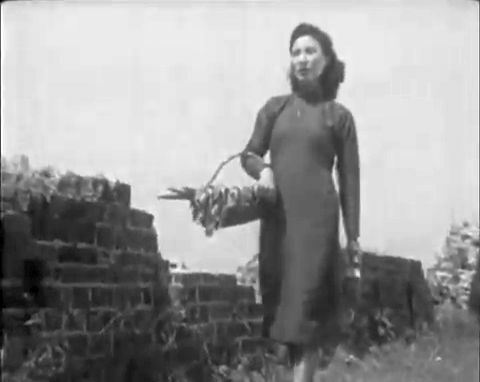 Meanwhile in the closing shot, Yuwen is back walking along the city wall. This time, though, in what suggests a possible reconciliation, Liwan hobbles along and joins up with her. Much of what makes Spring in a Small Town an effective work centers around the silent, soulful expressions of Wei Wei in the role of Yuwen. She always gives the impression of masking deeper feelings behind a seemingly impassive gaze, and her performance is magical. And the visual presentation of this heartfelt longing is where Fei Mu’s camera rhythms work their own magic. Similar to Wong Kar Wai’s In the Mood for Love, Fei’s film sustains a mood of people being on the knife-edge of surrendering to amorous passion, not just for a brief moment but for much of the film. 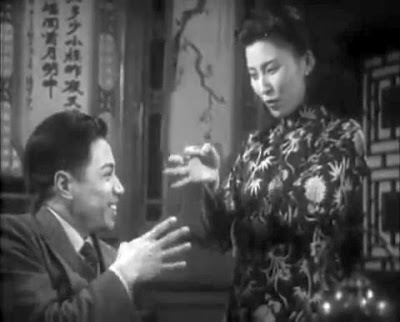 But Fei’s depiction may be even more subtle than Wong’s – his characters seem to have turbulent feelings that they, themselves, can’t even understand, much less articulate. This demonstrates the profound power of film expression. It is in connection with the mysterious and magical feeling of love that the film medium can offer deep expressiveness beyond the possibilities of the written word. And this is what Fei’s film accomplishes. The ending of Spring in a Small Town may suggest some sort of resigned resolution. The inhibitions and moral sentiments of Zhichen and Yuwen seem to have led them to withdraw from their longed-for passionate engagement. So it appears that they are finally resigned to adhering to their traditional social conventions. But is this true? Even here Fei’s presentation is not so simple as that. There may still be an opening for true love at the close of the film. 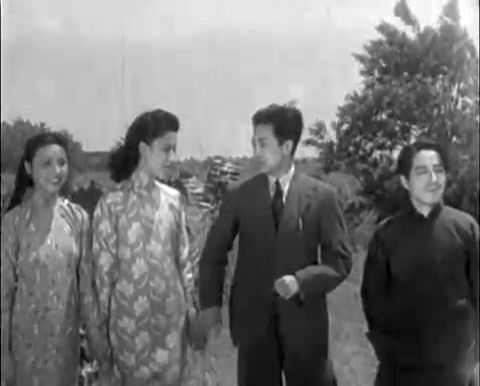 At the end when Lao Huang and Xiu are saying good-bye to Zhichen, they ask him when he will return to their small town. And he responds with, “next spring”. “‘Spring in a Small Town’ tops best 100 Chinese films in HK”, SINA English, (15 March 2005). Roderick Heath, “Spring in a Small Town (1948)”, Ferdy on Films, (2015). Richard Overy, “China's War with Japan, 1937-1945: The Struggle for Survival by Rana Mitter – review”, The Guardian, (6 June 2013). “Three Alls Policy”, Wikipedia, (14 August 2016). “Second Sino-Japanese War”, Wikipedia, (11 February 2017). 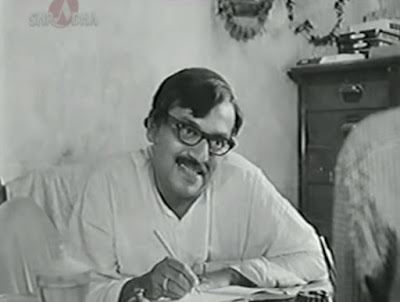 Pikoo (Pikoor Diary, 1980) is a short (25-minute) film by Satyajit Ray that he made for French television. Based on Ray’s own short story, “Pikoo’s Diary”, the film follows a day’s activities of an innocent six-year-old boy in the context of troubling family circumstances. Because much of the focalization is on the six-year-old boy, the film’s view of worldly concerns has a dreamy, but ultimately melancholy, perspective. The story has a single setting, the residence of a well-to-do Bengali family, whose young son is Pikoo. It begins in the morning with Pikoo’s father getting dressed for work and speaking to his wife (played by Aparna Sen). From their conversation we learn two things – (1) because of an unexpected school holiday, Pikoo will be staying home for the day, and (2) their marital relationship is stale. In fact the father indicates that he knows his wife is having an illicit affair. After Pikoo watches his father drive away, he hears some persistent dog barking. So he yells at the dog to be quiet, and, surprisingly, the dog stops barking. 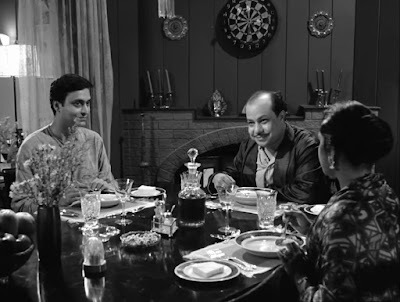 Later when the home phone rings, Pikoo picks it up first and recognizes the voice of “Uncle” Hitesh (Victor Banerjee), who is evidently his mother’s paramour. Then when the mother picks up the phone, she tells Hitesh that even though Pikoo will be at home, he should come over anyway. 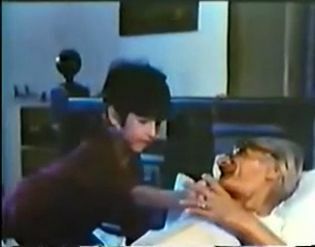 Pikoo then goes into the room of his aged grandfather, who is bedridden from some recent heart attacks. Pikoo worriedly, but innocently, tells his grandfather that he had heard his parents angrily quarreling the previous night. The grandfather is disturbed to hear that he was also a subject in the parents’ quarreling. Soon enough Hitesh arrives and gives the delighted boy a coloring kit with a set of colored pencils. Since the mother and Hitesh clearly want to be alone, the mother assigns Pikoo some busywork – he is to go out into the family garden and paint all the flowers he sees in accordance with their true colors. So Pikoo runs outside to pursue his assignment, while his mother and Hitesh retire to the bedroom. There is now an extended sequence showing Pikoo wandering about in the garden and enmeshed in the lush complexity of nature. Finally he comes to some white flowers that present a problem for him. He has no colored pencil for the color white. So he calls out to his mother, who is upstairs in bed with Hitesh, to explain his predicament. Pikoo’s mother, of course, is very disturbed by the required context switching from passionate love to doting mother and back. Her reaction disturbs the self-centered Hitesh, too, and he angrily gets ready to leave. In the end Pikoo solves his problem by outlining the white flower with a black pencil. But then some raindrops start falling, smudging his drawing, so Pikoo comes inside. When he enters the house, he hears from outside their bedroom his mother and Hitesh still arguing, so he yells out for them to be quiet, and again the noise stops immediately. Pikoo now goes in to see his grandfather and discovers that the old man has just died from a heart attack. 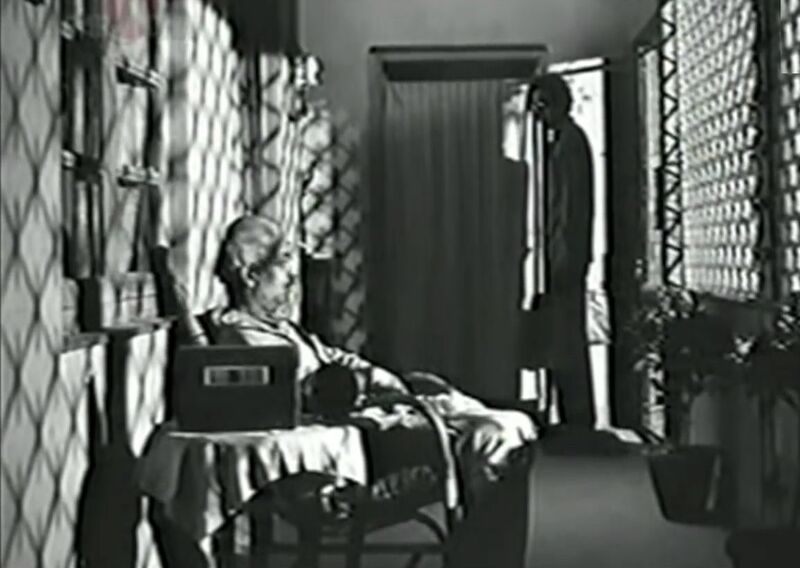 The film ends with Pikoo sadly sitting in a chair and crying, while his guilt-ridden mother looks on. "Pikoo is a very complex film. It is a poetic statement which cannot be reduced to concrete terms. One statement the film tries to make is that, if a woman is to be unfaithful, if she is to have an extramarital affair, she can't afford to have soft emotions towards her children, or, in this case, her son. The two just don't go together. You have to be ruthless. Maybe she's not ruthless to that extent. She's being very Bengali. A European in the same circumstances would not behave in the same way." 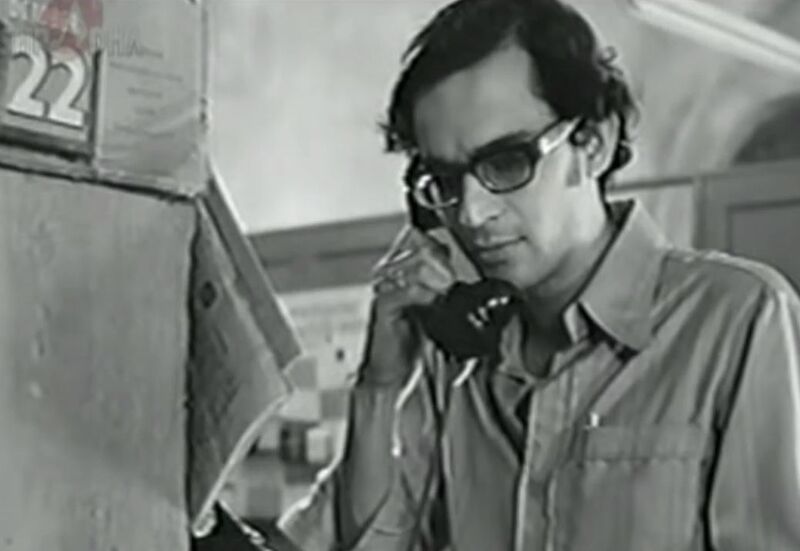 Early in the film, Pikoo dials some random phone numbers and gets connected to some random businesses. He doesn’t understand the specific contexts of those businesses and so doesn’t know how to talk to the people on the other end of the phone. This is a symbolic example of how we can be superficially connected and yet still be isolated. When Pikoo yells “hush!” to the dog and later to the quarreling lovers, his trial command works on both occasions. So he may think he has learned a universal command concerning how the world operates. But we know that he will soon discover the world is more complicated than that. In fact he may later find himself heading down the path towards more isolated involvements, too. When Pikoo draws the white flower by outlining it with a black pencil, there may be a suggestion that moral purity can only be identified by the absence of and in contrast to black tarnish. Also, when the raindrop smudges his drawing of the white flower, it may suggest that the complex workings of nature tend to blur the moral boundaries that we artificially make in the world. There is no ultimate prescription in Pikoo that I could see; only melancholy resignation to life’s mysteries. Satyajit Ray, “Cineaste magazine interview with Satyajit Ray”, Ray on Ray, SatyajitRay.org, (1982). 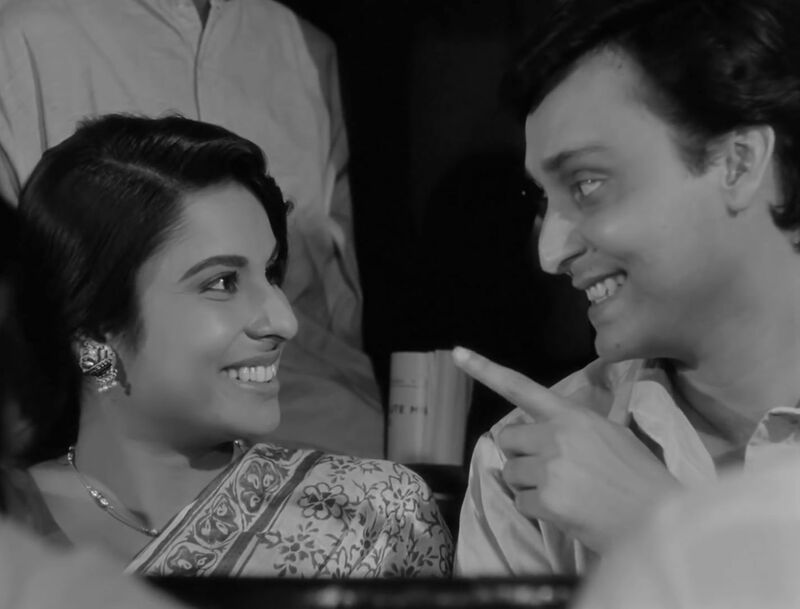 Satyajit Ray’s Kapurush (The Coward, 1965) is a low-key romantic drama that was released as part of a double feature with another film that Ray made at the same time, the comedy Mahapurush (The Holy Man, 1965). Actually, the two films are not really thematically connected to each other, but since each one had a running time of a little more than one hour, Ray decided to put them together as a double feature. Given the light-hearted and romantic nature of the double feature, Ray fashioned a Hindi-language-dubbed version of the films, but it was not a commercial hit and not ranked as a Ray masterpiece . Nevertheless, I think Kapurush is an outstanding work and deserving of more recognition. 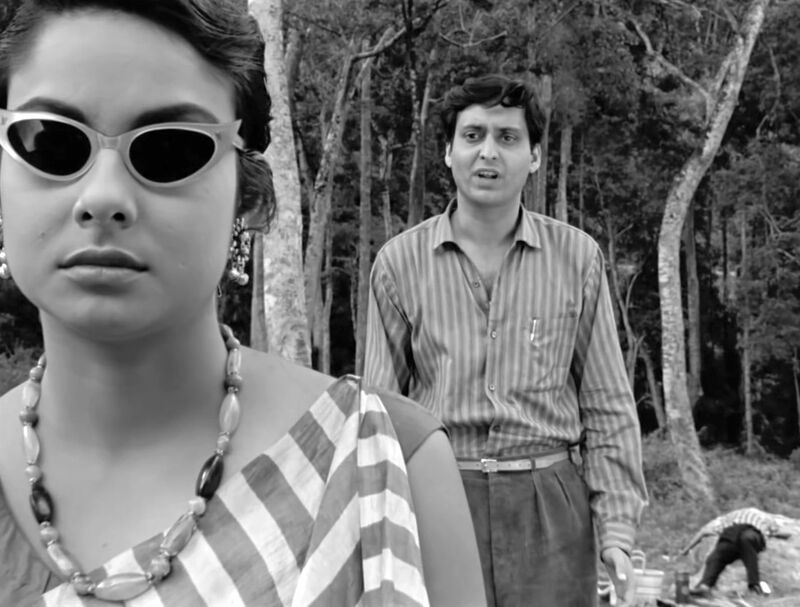 In fact Kapurush is much more closely linked with Ray’s two preceding films, Mahanagar (The Big City, 1963) and Charulata (The Lonely Wife, 1964), and there has been some suggestion that the three films form a trilogy . After all, all three films feature a married woman who struggles to cautiously assert herself while at the same time maintaining decorous behavior within the confines of Indian social expectations. And in all three of these films, the actress who plays this married woman is the gifted Madhabi Mukherjee. Ms. Mukherjee always presented an understated, but still naturally sensuous, demeanor that subtly conveyed her feelings just through emotive glances and gestures. Indeed, maintaining an ambiguous emotive posture was something that she probably had to artfully practice in real life, since Ms. Mukherjee and Satyajit Ray were rumored to have had a romantic relationship during this period. Haradhan Bandopadhyay, who appeared in five Ray films, including Mahanagar. Of course romantic triangle stories are quite common, but what makes this particular instance interesting is the light that it sheds on the mysterious and ephemeral nature of romantic love, itself. 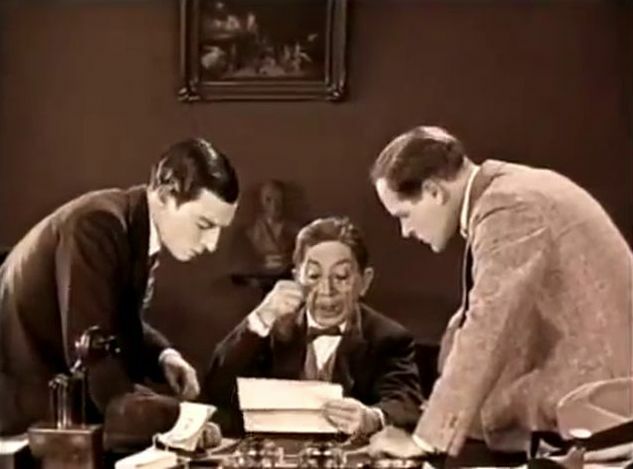 This is due to Ray’s artistry (as usual, he was responsible for the script, music, and direction for the film), as well as the nuanced acting on the part of the three principal characters. The story of Kapurush revolves around a man’s chance meeting of a woman with whom he had once had a serious love affair. She is now comfortably married to another man, but because circumstances have now thrown the three of them together in an isolated location, uncomfortable memories and feelings are resurrected. The narrative unwinds over three basic acts. 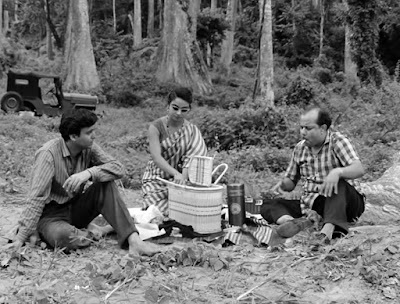 In the opening scene, Amitabha Roy (Soumitra Chatterjee), a film scriptwriter from Calcutta (Kolkata) is shown discussing the breakdown of his car with an auto repairman in a remote town some 600 kilometers north of Calcutta. Amitaba (aka Ami) learns that the needed repair parts are not locally available, so he will have to stay in the area while waiting for his car to be fixed. Fortuitously, a local tea plantation owner, Bimal Gupta (Haradhan Bandopadhyay), witnesses this conversation and graciously invites Ami to stay at his nearby bungalow over night while his car is being repaired. 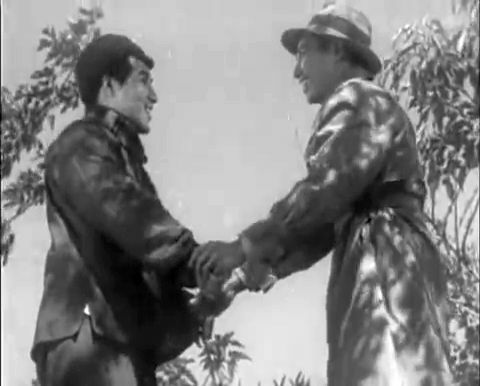 Ami is delighted by such kindness, and the two of them set out in Bimal’s car. All this is shown in a single, bravura camera shot lasting 4:08 and featuring multiple compositions as the camera tracks in and out over the course of the shot. 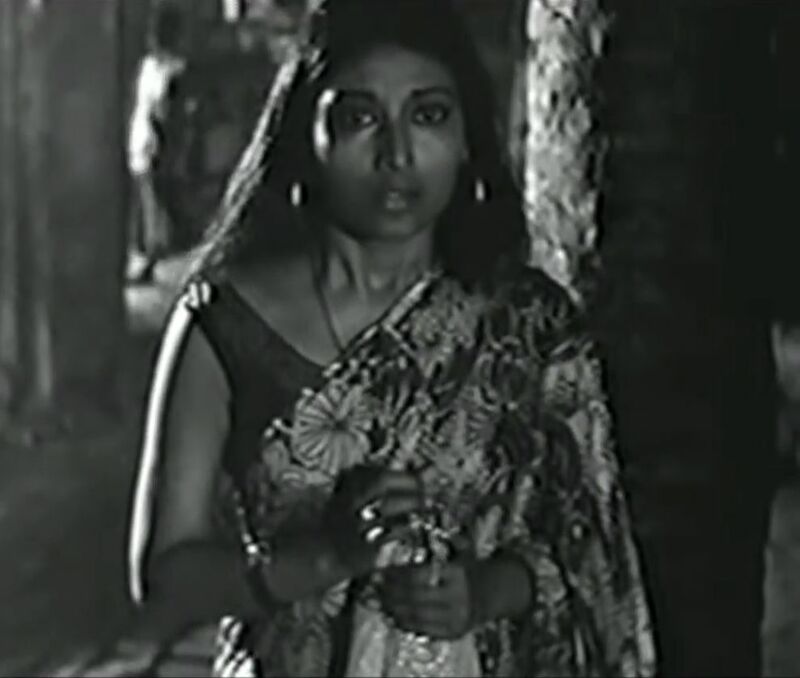 When they arrive at Bimal’s house, Ami is introduced to the man’s wife, Karuna (Madhabi Mukherjee), whom Ami is stunned to recognize as the woman with whom he had once been madly in love. Upon seeing Ami, Karuna frowns slightly, but her countenance is otherwise opaque, and the two of them do not acknowledge their past in front of Bimal. As Bimal and Ami socialize over dinner (Karuna is present but relatively taciturn), we get to see just how different the two men are. Although both men are convivial and the types of men you run into all the time, they are by temperament almost exact opposites. Ami is sensitive, thoughtful, and modest. Bimal is a boastful motormouth who loves to hear himself talk. He is continually making rhetorical comments, laughing at his own jokes, and talking while his mouth is full of food. In fact if we were to identify the two men in accordance with the Myers Briggs Type Indicator (MBTI) , Ami would be characterized as INFP (i.e. Introverted, iNtuitive, Feeling, and Perceiving), while Bimal would be characterized as the opposite, ESTJ (Extraverted, Sensing, Thinking, and Judgmental). There are plenty of INFPs and ESTJs in the world, but they are very unalike. Ami can’t help noticing that Bimal, though kind-hearted, is relatively insensitive to his wife. Though Bimal and Karuna have been married for more than three years, only recently has Bimal learned that Karuna has artistic talents as a painter. In fact Bimal spends a good deal of time bemoaning his boring provincial life and sopping his self-pity in alcohol. Ami must wonder how Karuna could have married such a person, who is not even a Bengali. In his bedroom that evening Ami lapses into a flashback of a critical moment some years ago when he and Karuna were in love. One evening Karuna boldly came alone to Ami’s disheveled apartment for the first time to inform him that in a few days her uncle (presumably her guardian) was moving hundreds of kilometers away to Patna and intended to take Karuna with him. 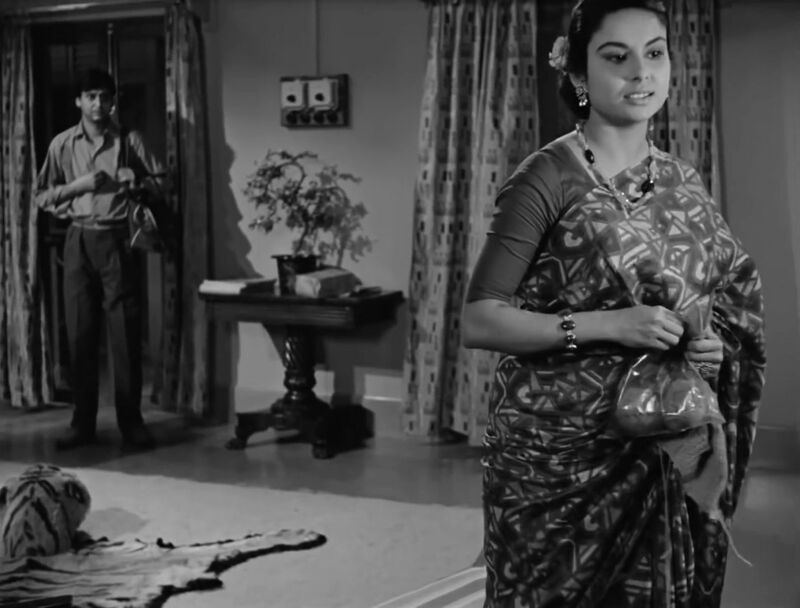 She affirms her love for him and tells Ami she wants to defy her family and stay with him in Calcutta. Ami understands that she is basically proposing marriage, and he can’t help expressing his hesitation about this. After all, he is just out of college and unemployed, and committing to marriage is the most important step in a man’s life. He asks her for more time to think things over. Ami’s reserved and “cowardly” reaction to her passionate love declaration crushes Karuna, and this ended their relationship. Emotionally disturbed by his this memory, Ami comes out to the living room and finally gets a brief moment to speak with Karuna alone. He asks her doubtfully if she is truly happy (with her marital existence, he is presumably thinking). But Karuna doesn’t even answer the question and only shows Ami polite indifference. When Ami asks her for sleeping pills, Karuna gives him her bottle; but seeing the anguished look on his face, she mockingly warns him to take only two pills. In the morning Ami is informed that his car won’t be fixed that day and that he might as well take the train that evening to his intended destination. The rest of the day will be spent on an outing and picnic with Bimal and Karuna. As they travel to the countryside in Bimal’s jeep, Ami has two more flashback memories of his old days with Karuna. One is about how they happened to meet for the first time on a bus. Another memory, occasioned during the drive when he sees Karuna’s beautiful hand linger on Bimal’s shoulder, recalls a moment when he used the excuse of reading Karuna’s palm to enjoy the momentary opportunity of just touching her hand. When they stop for their picnic, Bimal takes a snooze on the grass. Ami, still in love with Karuna and unable to believe she loves Bimal, uses the opportunity to timidly approach Karuna again. Karuna is serene but completely unresponsive. So he hastily pens a note to her asking her to meet him at the train station that evening and run away with him. He promises her that he won’t be a coward this time. They drop Ami at the train station, and Ami waits for some time on a bench for the train. Finally and much to Ami’s excitement, Karuna does come. But she only asks him to return her sleeping pills that she had earlier given him, and then she departs as the film ends. 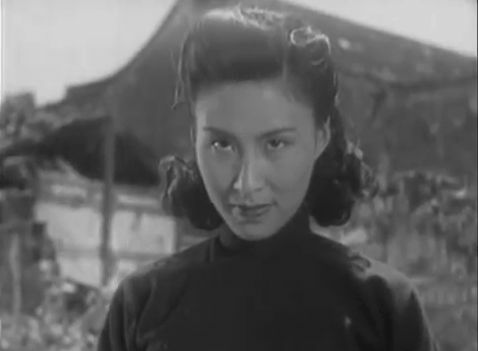 The ending of the film may remind some viewers of past masterpieces in a similar vein – the British film, Brief Encounter (1945) and the Chinese classic Spring in a Small Town (1948) – in which already-married individuals meet and develop heartfelt romantic feelings, but spurn them in order to return to their existing families. However, on this occasion in Kapurush, the ending is more clearly steeped in regret. "when a woman was done with a man she was done with him utterly." And yet, we have to ask ourselves why Karuna bothered to come to the train station just to retrieve her bottle of sleeping pills. Was she still bitter and doing this just to torture Ami? It is possible, but I don’t think so. I think she was offering Ami a second chance. By boldly coming to him at the station, she was offering him another opportunity to “seize the day”. What Ami should have done was to passionately embrace her. Of course, there were risks to this, and he never took risks. She took all the risks (a common feminine theme in Ray’s films), and she may have been waiting for a passionate assertion of his love for her. But he held back and thereby confirmed his nature as a coward. 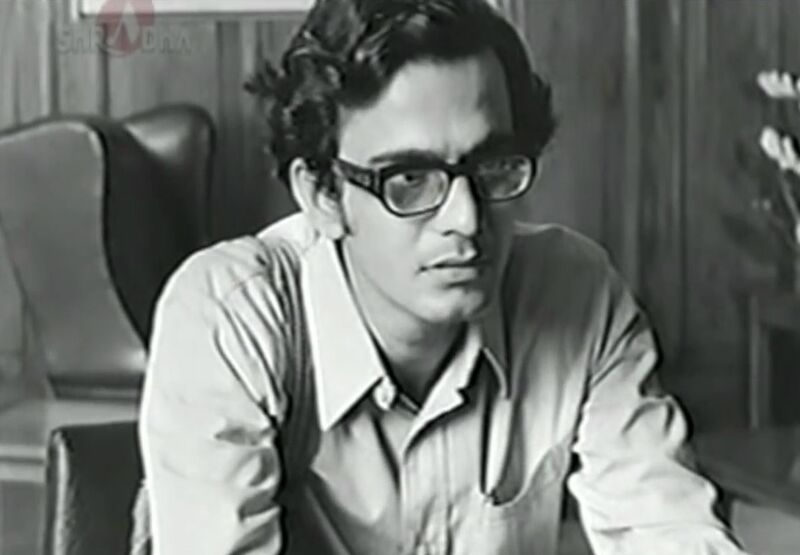 Marie Seton, Portrait of a Director: Satyajit Ray, (1971), Indiana University Press, pp. 143, 199-201. Chale Nafus, “KAPURUSH (THE COWARD)”, Austin Film Society, (2014). “Myers Briggs Type Indicator”, Wikipedia, (27 January 2017). Saul Bellow, Herzog, Viking Press, (1964). Satyajit Ray’s The Middleman (Jana Aranya – English meaning: “The Human Jungle”; 1976) was the third installment of his Calcutta Trilogy, which also included The Adversary (Pratidwandi, (1970) and Company Limited (Seemabaddha, 1971). Although the narratives of the three Calcutta Trilogy films are not linked, they have the commonality of portraying the struggles of a young man trying to make his way in the ruthless and turbulent world of the big city. In addition, The Middleman’s narrative is based on a story by Mani Shankar Mukherjee, who also wrote the story on which the earlier Company Limited was based. 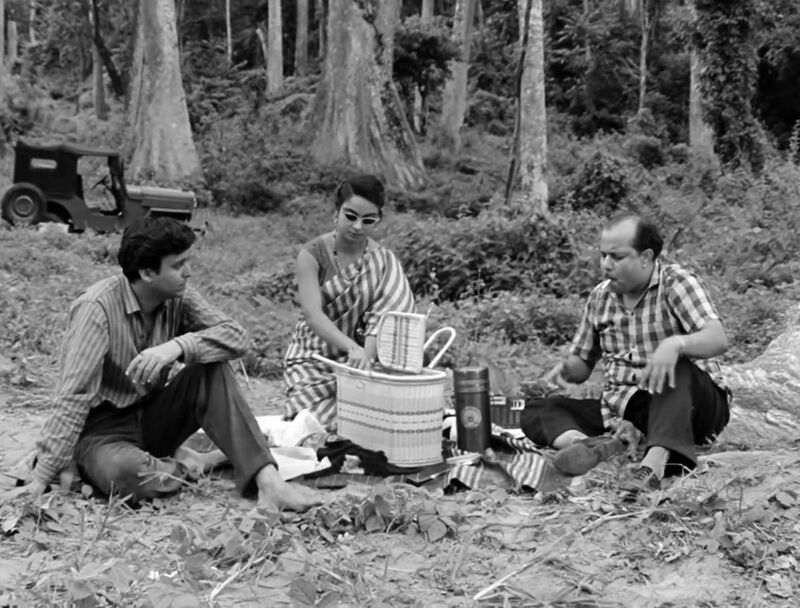 But of course the most common stamp across the three films comes from Satyajit Ray, who furnished the film’s scripts, music, and direction, with the usual able assistance of cinematographer Soumendu Roy and film editor Dulal Dutta. In fact it is useful to consider The Middleman in terms of a larger sociohistorical landscape. When people work together in groups, there are always some organizing principles in force, and the basic structures of these principles have evolved over time. We could say that the most primitive organizational stage is the family or clan. This has been extended to larger organizations, such as warlord parties and mafias, but it is still strongly hierarchical and autocratic. A second organizational stage is institutional, and we could call it the “Company” arrangement. Here groupings and relationships are based on rules and contracts. People belong to companies and organizations that have standard rules of behavior and resource distribution [2,3]. One might think that the Company stage is where we are today, but there is a third organizational arrangement, which has always been around in some form but which is gradually becoming more prominent, and we might call it the “Atomistic Supply Chain”. In this third system, everyone is an individual producer or service provider, and interactions are primarily local and one-to-one. (Some people simply might call this third arrangement "modern capitalism", but 'capitalism' is an overused term with multiple referents; so to avoid confusion, I will avoid using that term here.) It is this third organizational system and its troublesome features that is in focus in The Middleman. Family/Clan. Relationships are more personal, but they can be unbalanced, and there is a tendency towards autocracy. Company. Relationship are normalized according to rules and management policies. The system can be corrupted here, too, (cf. Company Limited), but it is less common. Atomistic Supply Chain. With little commons-preserving oversight, this arrangement is more lawless and subject to unbalanced power relationships. The narrative of The Middleman moves through three phases, which have varying focuses on the above three organizational arrangements. The film opens with a final-year history examination at the University of Calcutta. Here we’re in the midst of a “company” (the university), which is weighed down with bureaucracy and boredom. The students are openly cheating, and the bored exam proctors can’t be bothered to stop it. Somnath Banerji (played by Pradip Mukherjee), one of the examinees, is not a cheater even though his friends are involved. When the examination scripts are graded, an overworked eyesight-impaired grader cannot read Somnath’s cramped handwriting of his assigned essay, and so he just awards him an average grade, which means that Somnath will graduate from the university with a “pass”, rather than with “honors”. Although only forty percent of the students managed to get a pass, Somnath’s pass is a disappointment, because he will find it almost impossible to get a decent job. On the family front things aren’t so good, either. Somnath’s girlfriend (played by Aparna Sen) tells him her family is forcing her into an arranged marriage and bids him farewell. In addition Somnath’s father is poor, but is a proud Brahmin and is disappointed in his son’s performance. He unfavorably compares Somnath to his older son, who is married and has a good job. And the older son, himself, is patronizing and mildly scornful of his younger brother, Somnath. So Somnath, together with his friend Sukumar, sets about on the almost hopeless task of applying for jobs. In some cases the number of applicants for an advertised position exceeds 100,000. This part of the film mirrors the similar sequence in Ray’s The Adversary. Even when Somnath does manage to get an interview (and as we might remember from that earlier film, the interviewee-to-job ratio is usually greater than 10 to 1), Somnath is merely asked questions about meaningless facts. On another occasion, he and Sukumar have a friendly meeting with a self-satisfied Member of Parliament, who vainly delivers meaningless platitudes about the government’s responsibilities. So neither the Family/Clan nor Company worlds are working for Somnath. It is now time for Somnath to explore the Atomistic Supply Chain world. Somnath finally happens to run into an old acquaintance, Bishu Bose, who is in business for himself. Bishu introduces Somnath to the “order supply” business and invites Somnath to join him. In this realm, each person pretends to be an operative of a commercially established going concern but is actually only operating as an individual. The job is to buy supplies from producer factories and sell them to businesses. In other words, one operates as a middleman. In fact since the Bengali word for this kind of work, “dallal” (broker), is sometimes used in the unsavory context of being a pimp, Bishu and his colleagues prefer to use the English term “middleman”. The problem with this middleman business is that there is no adjudicative oversight. Although everyone in this business that Somnath meets is cordial and affable, appearances can be deceiving. The people with whom you deal can lie, cheat, and double-cross you at any point. As one of Bishu’s business colleagues cheerfully warns him, he must always immediately count his money when he is paid – “people are always looking for a chance to cheat you, including me.” Another senior colleague, Adak, cautions him, “Never show your cards.” And as Bishu, himself jocularly tells Somnath, if you get into trouble, you will have to clean up your mess, yourself – noone will help you out. In the course of Somnath’s apprenticeship, he gradually learns that bribery is a normal part of his business. And yet Somnath seems to still be the genuine young man with sincere scruples. As Adak tells him, Somnath’s authenticity is what makes him appealing to people (and appear to be trustworthy in the cutthroat world in which they all are operating). Finally Somnath manages to set up a big deal to sell “optical whitener” chemicals to a textile firm managed by Mr. Goenka. But Somnath has trouble closing the deal, and Mr. Goenka hesitates to sign off on it. 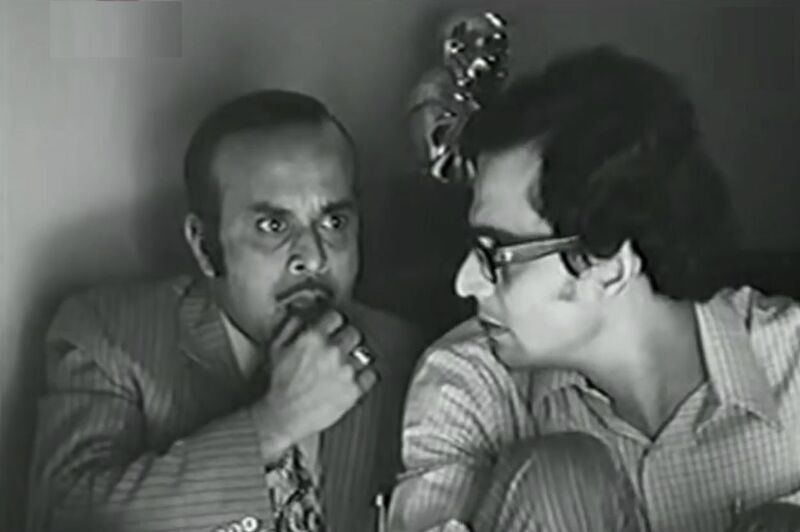 So Somnath turns to a “public relations consultant”, Mr. Mitter (memorably played by Rabi Ghosh), whose specialty is to spy on potential business partners and find out their weaknesses. Mitter duly discovers that Goenka will close the deal if Somnath can supply him with a prostitute. After a lengthy series of delays and wrong turns, Mitter and Somnath do secure a woman for Goenka the next night. But unbeknownst to Somnath until the last minute, the prostitute turns out to be his friend Sukumar’s sister, Kauna. Somnath tries to thwart the deal and pay off Kauna with his own money, but she refuses. This is the way she now lives, she tells him. And so Somnath ends up being a pimp after all. When Somnath comes home, his worried father rejoices to hear that Somnath has closed the big deal. 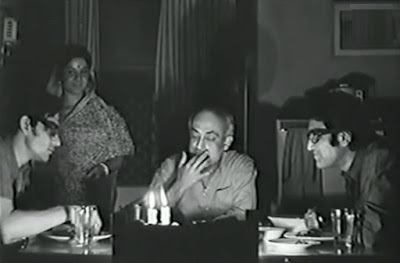 But Somnath hangs his head in shame as the film closes. The Middleman’s story is told in a leisurely way with a string of conversations that establish the seductively easygoing atmosphere that masks the sinister nature of the “human jungle”. Ray does this mostly with back-and-forth medium closeups during the conversations, so that a sense of visual separation is maintained and linked by adroit editing. Ray’s music is kept to a minimum in this film, leaving the office background noises and silences to maintain a solemn feeling of emptiness. Overall, I prefer The Adversary’s poetic sense of personal melancholy to The Middleman’s descent into corrupted compromise. The Adversary still leaves one with a sense of hope, while The Middleman closes on despair. Nevertheless, there are important lessons to be learned from The Middleman. The Middleman shows us the agony that Indian society was going through as it adapted to the tumultuous changes arising from independence and the adaptation to world culture. Of course these disruptive changes led to new opportunities, but they brought upon a “human jungle” that had its costs. This is what the Atomistic Supply Chain world brings about, and it is now increasingly spread across the globe, even if many people don’t realize it. You may find that your own local business community is going through the same disintegrative processes and increasingly breaking up into smaller independent units – a manifestation of the emergence of the Atomistic Supply Chain. This is partly due to the appearance of new information and communication technologies (ICT) that support immediate, long-distance trading interactions that create flexibility and lessen the need for long-term warehousing. While this introduces some flexibility, it also creates an unruly anarchy of unmoderated opportunists – the human jungle. The problem is that many of these supply-chain deals involve power imbalances. One side with enough power and connections can lie or renege on the deal and get away unscathed. This is the kind of lawless and unprincipled (because it flouts human rights) world that the current President of the United States, Donald Trump, seeks to make the basis of his Presidency. He is only familiar with deal-making, not with the maintenance of norms and principles (associated with the Company organizational arrangement) that can maintain the viability of an inclusive society. The only pathway forward is not to banish the Atomistic Supply Chain (which would not be feasible, anyway), but to tame it – by introducing measures that can bring it under a more benign arrangement. Here ICT may come to the rescue and mollify what it has brought forth. This could possibly be accomplished by means of new developments in blockchain technology . Blockchain technology is a new secure and fully distributed way of trading information that is complicated but is worth keeping your eye out for. So The Middleman is not just about India at a certain time, but also about the world we live in now. Ray’s film artfully shows how seemingly innocent corrupting influences can bring about an imbalanced and unjust world, and thus it is still very much worth seeing. Rob Edelman, “Jana Aranya - Film (Movie) Plot and Review”, Film Reference, (n.d.). Douglass C. North, Institutions, Institutional Change and Economic Performance, Cambridge University Press, (1990). Daron Acemoglu and James Robinson, Why Nations Fail, Crown Business, (2012). M. Nowostawski and C. K. Frantz, “Blockchain: The Emergence of Distributed Autonomous Institutions”, SOTICS 2016, The Sixth International Conference on Social Media Technologies, Communication, and Informatics, ISBN: 978-1-61208-504-3, Aria, pp. 29-35, (2016).